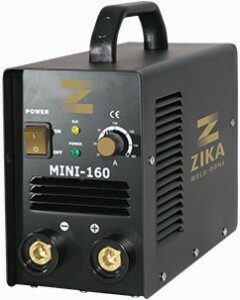 Welding Machines - Mini 160 – Zika Industries Ltd.
Home Catalog Welding & Cutting Machines Stick Welders Welding Machines - Mini 160 – Zika Industries Ltd.
A single phase, easy to carry welding machine that arrives in a rigid carrying case that is particularly durable, combining maximum convenience in carrying. The box protects the welding machine so that during storage too, the machine is protected from dust and blows and is optimally stored. 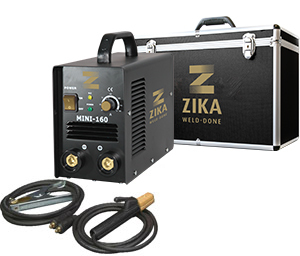 The welding machine provides a great solution for welders who perform various welding jobs using electrodes of up to 3.25 mm diameter in the maintenance and general joining field. The welding machine is intended for intensive welding work at a maximum current of 166 amps, non-stop. May work with a generator of 8 Kva output. 16 mm2 cross section welding cable. 16 mm2 section earth cable. 2 meter standard power cable and standard approved Israeli type plug.